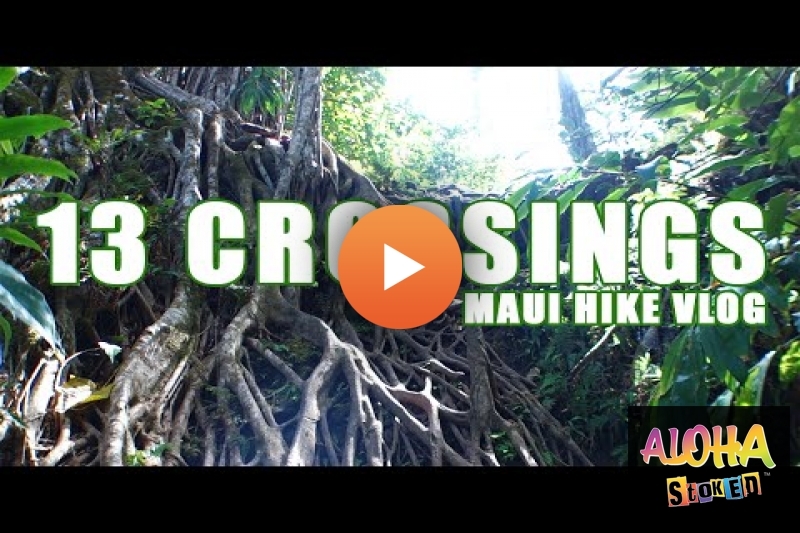 "13 Crossings" or Makamakaole Trail is a beautiful little hike that starts at the 8 mile mark on highway 340 in West Maui. The hike is about 2.5 miles round trip and good hiking shoes, or "toe shoes" are strongly recommended. Hope you guys enjoy the vlog!, and mahalo's for your video shares! You's rule! f : Aloha Stoked - http://www.facebook.com/alohastoked for more Maui Vlogs! Video brought to you by Island Feet Maui : Island Feet is an orthotic and shoe store designed to help foot and alignment problems like Plantar Fasciitis and Heel Spurs. We did this hike, and learned for sure to BRING BUG SPRAY!!! We accidentally forgot it and my wife got lit up by the biters! Part 2 yeah right. Dude, you never get wet or take any chances. You are missing out. So stoked I found this channel. I first visited Maui in 2001 and left a piece of my heart on island. I have been back seven times at different times of the year. I am planning my next trip for 2021, which is a big birthday year for me. Your videos are a great way to revisit places I have already been, and introduce me to places I haven't yet visited. I love your laid back style. Mahalo for posting. Also tourists are getting their windows smashed in all summer there. pretty bummer. Super cool video guys. Thanks for making it. Make wun video behind Iao Needle, jus follow the back trails and IF you see my udda plantz can u watah dat ones too, mahalo!! Since you stay ova dare, can u watah my plantz??!! Good to see you on a bike again Kalani. Even if it isn't Athena 2.0! That ocean is BLUE brah! That looks like an awesome hike!! Absolutely beautiful, added to our bucket list! If it wasn't so hard for Canadians to move to Maui we'd already be there! Great video and thanks for sharing your little slice of paradise! How did you do the audio on this video? Much love for your Maui beauty spots videos. That part 2 sounds like some next level action though. I can't watch these videos anymore, they're making me want to move to Hawaii!